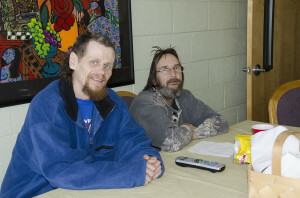 We caught Donny and David enjoying snacks and watching a basketball game on tv when we visited briefly today in our new Respite facility. Donny wants everyone to know he’s ‘back,’ though still recovering from the two stab wounds to the chest he suffered a couple of weeks ago. Still very pale and quite weak, he says it will take a while, but he hopes to be out and about soon. He said he is receiving lots of TLC at Respite, and is thankful to have this care and a roof over his head while he gets his strength back. When he is discharged, he plans to go back to his tent, as right now he and his wife, Raven, have nowhere else to go.